Is this the world's most Instagram'd coffee? That's the claim made by Dayne Levinrad, the barista behind the Coffee In a Cone craze sweeping South Africa. Since launching in January, nearly 1 million images with the #coffeeinacone hashtag have been liked on the picture-sharing social media site. 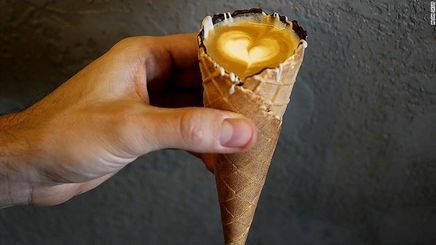 But while the idea is simple -- serve coffee in an ice cream cone lined with chocolate -- Levinrad says the science behind his creation is not.